Tonight I thought I would share a couple of interesting Buddha location beliefs that I just found online – well, I find them interesting anyway. 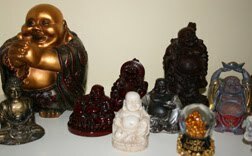 Problem is, because I have so many Buddha’s in my collection, I have broken most of the no should do’s already. Mmm I think I might check out some rearranging tomorrow. 1. Facing the main door: Many feng shui consultants recommend placing the Buddha opposite the main front door of a home, on a table, that is about thirty inches in height. This location allows Buddha to interact with the chi coming in from the door. From this position, he can neutralize the chi, and make it lucky. 2. In the living room: Buddha is also quite comfortable in the living room. The best position for Buddha in the living room is facing towards the front door. 3. On a desk: For all the students out there, placing Buddha on a desk is perfectly acceptable. He can help in assisting you in fulfilling your goals. 4. Office table or reception's desk: For those that own a business, placing Buddha on a reception’s desk can help bring prosperity to your company. While there is no bad spot to place a Buddha in, this is the one caveat. Some feng shui experts frown upon placing Buddha in a bedroom or dining area. Other than these two locations, however, you can place Buddha just about anywhere. Some final tips about the feng shui Buddha location involve his height placement. Avoid putting Buddha on the floor; doing so is disrespectful. The Chinese say that Buddha prefers being placed high up, and when he's happy, hopefully, the home is happy. Additionally, don’t forget to rub Buddha’s belly. While it's not a requirement (and should be taken in good fun), many claim that rubbing Buddha's belly everyday (and the fatter the belly the better), will bring luck and prosperity to all in the home. Experiment with it today. After all, the only thing you stand to lose is luck and prosperity. Gotta get a Buddha for my house. Rubbing hubby's belly isn't working. And what the heck, I'm getting me a Buddha as well and placing it high on my desk facing the front door, that should cover a few of the bases! Thanks Davine, I never knew, mind you I also used to be extremely closed minded when it came to different objects... but what can a little Buddha hurt? Uh-oh, I need to move my Buddha to a higher shelf. Thanks for the advice.